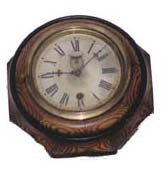 Waterbury Clock Co. "6 Inch Lever". 8 day time only movement is not running. No seconds bit or hanger bracket. Dial is 6 inches, case is9 inches across the back. Nice oak case and original dial. Has most of the label on the back. Ly-Waterbury No.658.